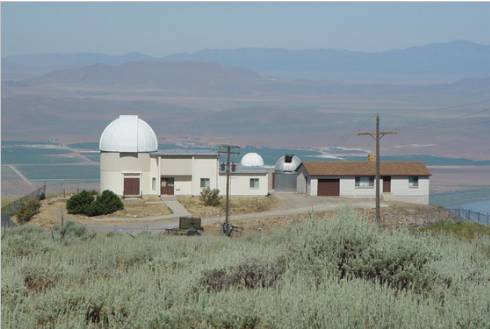 The largest, most modern observatory in Utah is the BYU West Mountain Observatory (WMO). It is located one hour from the BYU Provo campus at the southern end of Utah Lake, atop a 6,850 foot mountain that is its namesake. The site itself is far enough to the west and south of the developed areas along the Wasatch Mountains to render the sky brightness comparable to that of Kitt Peak, while the seeing conditions tend to be as good or better. The WMO was built in 1981 to house an aging 0.6m Tinsley reflector. This telescope was purchased in the 1950s and placed atop the BYU Eyring Science Center until local light pollution and encroaching buildings forced it to be moved. Realizing that the telescope was reaching the end of its useful life, BYU designed and built the WMO dome and building to house a one meter class telescope without requiring significant modifications to the facility itself. A home was built next to the observatory in 1982 where the resident astronomer lived until 1988. Until the mid 1990s, research and teaching were vigorously pursued at West Mountain. The dome visible on the south end of the building is 7 meters in diameter with a slit that is 1.3m wide. The large dome is the temporary location of a 0.5m RCOS optical tube mounted on a Paramount ME. The smaller white dome houses a 0.4m Meade reflector mounted on a Paramount ME. The small silver dome contains a 0.3m RCOS optical tube mounted on a Paramount ME. The house to the north is the resident observer's former quarters. The observatory itself contains a computer room, a local area network, an observing room with a window into the dome, several work areas, a small library, kitchenette, lavatory, living space, and two dorm rooms, each of which has two beds. The observatory and house together can sustain eight people for an extended observing run. The largest nearby town is Payson with a population of about 10,000. The communities of Genola to the south and Benjamin to the east are agricultural areas with low populations. Utah Lake borders the west and north. There is very little population west of the lake for hundreds of miles and the skies are especially dark in that direction. Although the population along the Wasatch front is growing, most of this growth is to the north. Zoning to the south and east of the observatory and the lake on the north and west ensure that the site will remain adequately dark for the foreseeable future.